After 10 years, they continue to push this never alive horse. I don't think so. Some Internet technologies have nothing to do with the enterprise and Facebook is definitely one of them. MyDeathSpace.com had an outage yesterday caused by their hosting service thinking they were under a DDOS attack. When in fact, it was all the buzz that was generating enormous amounts of legit traffic. MyDeathSpace is a blog and forum for tracking MySpace profiles of dead people. They've had quite a few outages in their first year. If you look deep enough into your Google Maps, then you may find an hCard; microformatted address cards. It's like looking at an Atom and finding an electron. Mefeedia has a great summary of the video blogosphere (vlogosphere). They are reporting 4,000 new blogs per day. Can you hear it? That noise. That background noise. It doesn't make a sound, but it's definately there. I never heard the Internet before, but 2007 brought noise to the Internet. Noise. It's all the chatter. The twittering. The facebook status updates. The MySpace messages. It's getting loud. It started with blogging. Thanks Dave! Then it was social networks and instant messaging. Add widgets. Now, I couldn't imagine camping without an Internet connection. The noise is like a soothing voice telling me that we are not alone. We have friends 10,000 miles away that know I'm camping, I'm working, I'm playing soccer with my daughter. She scored two goals! We all won. TechBrew : Atom nearly done, but can it compete with RSS? Google Wants to Control RSS? On Scoble's blog, Dave left the following comment which I have to highlight because it's just so wrong. The rest of your post is right. The big companies, including Google, are trying to take control of RSS, and itâs in contradiction to the roadmap, and just plain wrong. Iâve asked them to stop, and so far theyâve ignored the request. Thanks for raising the issue publicly. Google is trying to take control of RSS? Let's get this straight. Google's member on the RSS Advisory Board is Eric Lunt. He worked for FeedBurner. If Google didn't buy FeedBurner, then they wouldn't even have one member on the board. And I securely doubt membership on the RSS Advisory Board had anything to do with Google's purchase of FeedBurner. Previously, Jason Shellen, a member of the board, was employed by Google, but that's no longer true. Neither Eric Lunt nor Jason Shellen have been overly active on the RSS Advisory Board. Almost all the activities of the board are public and available on the website and message boards. The only private activities is nominating and voting for new members. Everybody has the ability to scour those boards and what you'll find is that Eric and Jason have been completely passive members of the board. So, how are they trying to control RSS? They aren't. It's just more propaganda from Dave Winer. Further, we have tried multiple times to include Dave Winer in the process at his own request. He's even proposed that he be a member of the board. In every case where we've tried to compromise, Dave simply broke off contact when a compromise was close. Dave has never responded to any of my private emails to move the compromise forward, nor have any of the board members indicated to me that he's sent them a private email. I've indicated to him that all the members have public profiles and can be contacted directly. Dave requested permission to post on the board mailing list in order to address the members. I offered to post whatever he wanted on the board mailing list and he never replied. Dave is all about propaganda and deception. He lies and somehow his posse continues to fall for his ploy. I'm losing respect for that posse. I woke up this morning to a lot of referrer traffic for the search terms LiveJournal down. It appears that a power outage took out LiveJournal, Vox and Typepad yesterday afternoon. There's more information on the Six Apart blogs. More propaganda from the master. An Attentional app form Chris Saad? Some people want you to believe that the RSS Advisory Board is unofficial and doesn't have the mandate to make clarifications to the RSS specification. I thought it would be great to create a time-line of the RSS Advisory Board. So that you can read the history yourself, thru blog entries, many from the horses mouth, Dave Winer's blogs. July 17 2003 - The RSS Advisory Board is created. The initial members are Dave Winer, Jon Udell and Brent Simmons. July 17 2003 - The RSS Advisory Board mandate is described as "write tech notes, advocate for RSS, make minor changes to the spec per the roadmap, help people use the technology, send flowers to developers, maintain a directory of compatible applications, accept contributions from community members, and otherwise do what we can to help people and organizations be successful with RSS." Note that it includes making minor changes to the spec per the roadmap. February 3 2004 - Dave asks me what I'd do if I were on the RSS Advisory Board. May 14 2004 - Rogers Cadenhead, Andrew Grumet and Adam Curry are added to the RSS Advisory Board. June 4 2004 - The RSS Advisory Board proposes its first clarification to the RSS 2.0 specification. June 19 2004 - The proposed clarifications are added to the RSS 2.0 specification. June 25 2004 - Dave Winer resigns from the RSS Advisory Board. Dave blogs "I feel that the process for clarifying the spec is now well-understood by the existing members." An admission that the board retains the right to clarify the specification. July 5 2004 - Steve Zellers is added to the RSS Advisory Board. There was never any announcement and nobody ever mentioned his role other than myself. September 15 2004 - Dave Winer acknowledges that the RSS Advisory Board still has work. "A perennial problem with RSS is how does the publisher force an unsubscribe? [cut] And many content people can't change their server in this way. I'm no longer on the RSS advisory board, so I won't be playing a role in solving the problem, but it needs to be solved. " December 2 2005 - I badgered the RSS Advisory Board lack of action and asked Rogers Cadenhead to replace the existing passive members. January 30 2006 - The RSS Advisory Board expands to include Meg Hourihan, Loic Le Meur, Eric Lunt, Ross Mayfield, Jenny Levine, myself, Greg Reinacker and David Sifry. March 22 2006 - Greg Smith joins the RSS Advisory Board. April 24 2006 - Jason Shellen and Jake Savin join the RSS Advisory Board. May 8 2006 - Matthew Bookspan joins the RSS Advisory Board. June 21 2006 - Jason Douglas joins the RSS Advisory Board. August 12 2006 - The RSS Advisory Board adopts minor changes to the RSS 2.0 specification. October 3 2006 - James Holderness and Paul Querna join the RSS Advisory Board. December 14 2006 - The RSS Advisory Board publishes the auto-discovery specification. March 12 2007 - Chris Finke joins the RSS Advisory Board. June 6 2007 - The RSS Advisory Board adopts minor changes to the RSS 2.0 specification. Nowhere was there ever any announcement that the RSS Advisory Board ceased to exist. Rogers Cadenhead was a member of the board along side Dave Winer and has been on the board ever since. None of the members other than Dave Winer have ever suggested that the board discontinued at any point and Dave only after the fact. Dave is simply upset with the direction of the RSS Advisory Board since he quit on his own terms. So now, he claims the RSS Advisory Board doesn't exist, as if his blog can change history itself. Robert Scoble had some interesting misunderstandings to say this weekend about The RSS Advisory Board. His blog entry has already been mostly butchered with corrections as people point out his numerous misunderstandings, but there remains a few more which I'd like to address. First, Scoble says "the RSS Advisory board, which includes members from Cisco, Yahoo, Netscape, FeedBurner (er, Google), Microsoft, and Bloglines". That's entirely true. What he fails to point out is the those BigCos make up only 6 of the 14 members of the RSS Advisory Board. Less than half. That's very deceptive and I'm disappointed that he'd try to pull that on his readers. Most of the members of the board are from small companies Rogers Cadenhead is an author of technical books and professional blogger. James Holderness works on an RSS reader called Snarfer. Meg Hourihan is a professional blogger. Loic Le Meur works for Six Apart (not a BigCo). Greg Smith works on an RSS reader called FeederReader. The board is controlled by SmallCos, not BigCos. Don't be fooled by Scoble. Second, Scoble says "this new unofficial board". New? It's been around since 2003. Second, it's the official board. It was created by Dave Winer himself. Who later resigned. In fact, it was Dave that put Rogers Cadenhead, the current chair, on the board. I'll recount the history of the board in a later post. Last, he says "The big companies are in charge and weâve gotta deal with any mess they get together and create for all of us." Well, they aren't in charge. Rogers Cadenhead is the chair of the RSS Advisory Board and he doesn't work for a BigCo. And, as I've already mentioned, less than half the board is manned by employees of BigCos. In fact, the three most active members of the board, Rogers, James and myself are not employees of any BigCo. All in all, this is very disappointing of Robert. I suspect that he was fed the propaganda from Dave Winer and he was likely completely misinformed of the truth. Disclaimer: I am a member of The RSS Advisory Board. I also created a website r-mail.org, which was purchased by NBC (a BigCo). I am on temporary contract to transition the website to NBC, but I am not an employee of any company. I'm a professional RV Blogger. Here's a couple classic quotes from Dave Winer's recent blog entry on FeedBurner and Google. I've been around this business a long time, and I was sure their strategy was to sell to a bigger company, and I don't trust big companies. [cut] So now someone at Google "owns" Feedburner and all their feeds. And they could, if they wanted to, change the feeds to another format, overnight, without asking anyone. Wow, classic Winer. Here's another way of spelling Winer; W-E-B-L-O-G-S-.-C-O-M. Weblogs.com was Dave's little non-profit piece of the blogosphere that he extracted from his old company Userland. Another way of spelling Winer is V-E-R-I-S-I-G-N. That's the company he sold his little start-up website and critical piece of the blogosphere to. So, somehow, it's all evil that Google now owns FeedBurner and has the power to screw their users. As we all know, Google's philosophy is to buy start-ups and screw their users over. But it's all good when Dave sells his website for $millions to a BigCo called Verisign that is known to be pure evil. Remember that it was Verisign that redirected domain lookup misses to their own search engine. The only thing I can add is a new spelling of Winer. Big controversy in RSS-land. First, Dave Winer and Robert Scoble tag team FeedBurner, then they tag team the RSS Advisory Board. This is nothing new from Winer, but I expected better of Scoble. As you can see from Scoble's blog entry, he's had to retract much of it as he didn't know what he was talking about. I'll write a few blog entries today to try and address each issues; FeedBurner and the RSS Advisory Board. Dave Winer wonders "what about an Event? How would you represent that in a RSS item?" There's already many solutions, but nothing has stuck. Someone wrote an RDF event RSS module. There's also Microformats' hCalendar. But I suspect the best solution is an iCal extension for RSS. Is anybody doing this? Dave Winer has asked the community for some nitpicking on his OPML 2.0 spec. I'm giving it a shot. Is it possible to make the jump from RFC 822 dates to ISO 8601 or is it too late? Could you specify which email formats are valid for ownerEmail attribute? 'mailto:randy@kbcafe.com', 'randy@kbcafe.com', 'luksa@dallas.example.com (Frank Luksa)', etc. The text attribute wasn't required in 1.0, but is in 2.0, which will invalid some feeds which were previously valid. The category attribute need an example. I think I understand, but there's too much room for misinterpretation. Could you say that the htmlUrl attribute must be a URL or something like that? What are the valid values of the language attribute? Please provide the known value of Atom feed version attributes. In inclusion, you rely on the file extension .opml when processing an element. I suspect this will prove problematic. Why not use a type='opml' attribute instead. In extending OPML, you say that extension element AND ATTRIBUTES can only be used if defined in a namespace. In OPML 1.0, you were allowed to add any attributes to outline in the OPML namespace. This will cause some 1.0 feeds to be invalidated by 2.0. The description attribute in 1.0 often contained HTML markup, but according to this spec, it may no longer contain HTML markup. Could we add a bit of text to specifically allow HTML markup in description. Requiring auto-disco to use rel='outline' invalidates most existing implementations of OPML autodiscovery. Maybe the value SHOULD BE rel='outline', rather than IS. Can you add a section on the OPML extension namespace. The year 2007 has already seen two great Web 2.0 start-ups makes breakthroughs. I'm sure there are more, but I wanted to speak to these in particular. After tremendous starts that gave them 0.15% reach, both start-ups appear to have stalled (at least according to the imperfect Alexa). I've also noticed that MyBlogLog has completely disappeared from my radar (nobody is talking about it) and Twitter has started to fade. 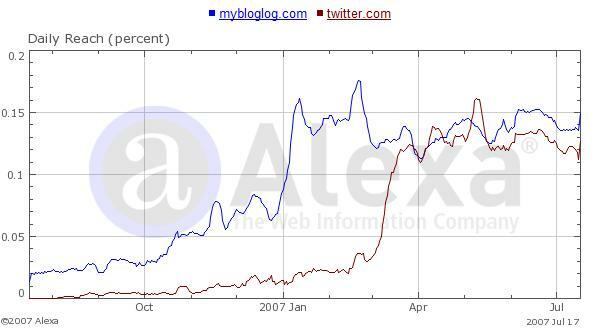 Both MyBlogLog and Twitter grew within the tech geek community. I've always had the opinion that website that grow in the tech geek community can grow quickly at first and stall. This seems to confirm that opinion. Last night, talking with my niece, she tells me that she's not too happy with Facebook anymore. She doesn't like all these applications. I think it's clear that Facebook applications have created the latest spurt of Facebook growth, but I wonder if that's not tech geek community driven and therefor doomed to stall. OPML 2.0 now has a namespace, at least for use as a vocabulary in other XML containers. Dave Winer selected http://www.opml.org/spec2 as the namespace URI and has already implemented it in his TwitterGram project. Here's a sample. EirePreneur: Is Facebook bleeding the blogosphere? A very interesting AJAXy RSS interface. Jason is a member of the RSS Advisory Board. You can now forward you Blogger feed to FeedBurner to get more accurate stats. Global Neighbourhoods: Is Ning Blowing up a Bubble? $200M for Ning? I don't think so either. Actually, it's a really bad idea. Vlad Akilov ranked five of the most popular RSS readers. Kent Newsome wants to know why RSS items can only have only one enclosure. A MySpace user discovered that they have a album Web service. I haven't tried it myself, but it appears functional. This is an interesting development on the back of their RSS feeds going AWOL. I've been informed that MySpace RSS feeds have been broken since late June. MySpace support has been informed of the problem, but there has been no response from them as to why or if it'll get fixed. I just checked mine and it's 404 (not found). I was one of the first people to get a Flickr account. This was long before the Yahoo! takeover. Over the years, I uploaded thousands of personal photos and used them in blog posts and more. After Yahoo! bought Flickr, the Uploadr stopped working and the support team was unable help me. Yahoo! had given me two years free because I was an early pro-user, but eventually even that wore off. A few months ago, I got an email saying I had to renew my membership. Since Flickr no longer worked for me, I decided not to renew. I didn't even bother reading the fine print either, but I assume it said in there that if I didn't renew, they were going to delete all my previous photos and they did. So, if you are a pro Flickr power-user, then you will have to pay them an annual amount, which they are free to increase, every year for the rest of eternity or you lose all your uploads. Everything. The comments. The photosets. Suckers! You want evil? Don't look at Google. Look to Sunnyvale. BTW, after the photos were deleted, the Uploadr started working again. I can only assume it was related to the volume of photos I had. Last, I was working on a Flickr widget when I discovered just how evil Yahoo! is. It works and you are free to use it, but I won't be building any more Flickr tools in the future. Basically, it takes a Flickr PhotoSet and creates an HTML slideshow. I was gonna call it the FlickrSetShow. AideRSS - Taming the RSS Beast - Coming soon. Several years ago, I applied for a Flickr API key. I didn't remember until just now that I had done such. Today, I was investigating writing a new photo application and stumbled onto this forgotten fact. The micro-application is now executing 50,000 API calls per week into the Flickrsphere. Wow! The power of APIs. FeedBurner's premium MyBrand service is now free. This service allows you to host FeedBurner feeds on your own domain. All of a sudden Facebook is a walled garden? I wonder where Jason got that? Open? How is a proprietary widget API open?